Effective advising is a cornerstone of successful graduate education. It is vital to the intellectual excellence and vitality of any program, to the successful inclusion of historically underrepresented groups in the academy, and to the launching of successful careers both within and beyond higher education. For the faculty, it is a key to sustaining a graduate program that enhances the intellectual community and the faculty member’s own research agenda. Advisors are responsible for supporting and overseeing students’ scholarly and professional development. Doing so requires careful listening in order to understand the student’s goals, constructive counsel, regular meetings, and timely feedback, as well as concrete advice on course selection, program requirements, scholarly presentations, and publications. The best advising includes mentoring, where mentoring is understood as an active process by which faculty advisors establish and foster structured and trusting relationships with graduate students by offering guidance, support, and encouragement aimed at developing their competence and character. Mentors listen actively to mentee’s concerns and care about their personal and professional well-being. Mentors want to help graduate students further develop their strengths, work through challenges, achieve academic excellence, and advance professionally in career paths of the student’s choosing (not their own). 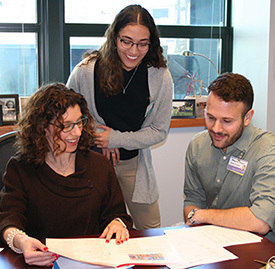 Mentors act as advocates and role models for their mentees and are committed to helping graduate students meet their personal and professional goals. While graduate students should be encouraged to develop a network of mentors, the advisor is expected to play a leading role. Brown University has developed a brief statement on Best Practices for Graduate Advising. Understand and respect that each graduate advisee brings different perspectives, experiences and interests. Communicate clearly and frequently with an advisee about expectations and responsibilities, ensuring with each communication that there is mutual understanding. Help the advisee develop a timeline for completing academic requirements and meeting professional goals. Meet regularly with an advisee to review progress, goals, challenges and future plans. Encourage openness about any challenges or difficulties that impact graduate student experience and work with the advisee to resolve any challenges, and/or identify resources for support. Listen to and support an advisee’s scholarly and professional goals. Be knowledgeable about departmental and Graduate School policies. Be aware of institutional resources that can provide support to advisees in times of academic, professional and personal challenges and whom you, as advisor, may consult for further guidance. Prepare an advisee to be competitive for future careers inside and beyond the academy. In recognition of how busy faculty are, we have sorted through a wide range of materials and offer here those that we have found most helpful. They are intended to enhance effectiveness without requiring dramatically more time. An extensive, detailed guide to effective mentoring: reasons for mentoring, general guidelines for mentoring, advice on initial meetings, how graduate programs can encourage mentoring and much more. Rich resources organized by topics such as advising international students and the effects of age, experience, race, ethnicity, and socioeconomic background on graduate student experience. A short statement on practices to avoid; some are obvious, some are not. Strategies and practices to consider when advising graduate students, from the Council of Graduate Schools’ PhD completion project, Mentoring and Advising section. Written by the Graduate Student Senate of Case Western Reserve University, this guidebook includes checklists and worksheets for faculty adviser- advisee first meetings and setting expectations, and addresses advising and mentoring within diverse communities. Concretely walks through expectations and expected academic milestones for the student. It prompts both the advisor and the student to set goals for communication and any other aspects of their working relationship. Highlights critical strategies and resources for effective mentor-mentee relationships: providing advice, focusing on communication, mentoring across difference, and setting goals and expectations. These case studies are designed to anchor faculty discussions of best practices in advising. They cover a wide range of themes and challenges that are encountered across the disciplines. The “Advising Agreement Between Graduate Students and Faculty” is based on the “Mentoring Compact” published by the Graduate Research, Education and Training (GREAT) group of the American Association of Medical Colleges (AAMC), on the IDP (Individual Development Plan) developed by the Federation of American Societies for Experimental Biology (FASEB), on material developed by the National Postdoctoral Association, and on the Guide to Mentoring Graduate Students, published by the Rackham Graduate School at the University of Michigan. All material is adapted with permission. The IDP helps students outline previous accomplishments, short-term and long-term training plans and career goals, as well as identify strengths and areas for improvement. The IDP is a communication tool for advisors and their advisees and is a good starting point to discuss academic plans and trajectories and future careers. CareerLAB offers support to graduate students on interviewing, job search, résumés, and cover letter writing, as well as some programming on careers outside of the academy. The office offers regular graduate student walk-in office hours and sessions by appointment. Online, free individual development plan for students in the life and physical sciences. The self-assessment highlights a student’s strengths and interests and suggests career pathways that may best suit the student. Online, free career exploration and planning tool tailored for the humanities and social sciences. Connected Academies, Preparing Doctoral Students of Language and Literature for a Variety of Careers. Online resources for career diversity for language and literature students, guides for PhD programs and faculty advisers for doctoral student career planning, and much more. This online project is a Mellon Foundation funded project of the Modern Language Association. The Versatile PhD. Online resource for career exploration for PhD students.